Gallstones are a common disease that can affect around 30% of individuals by the time they reach 50 years old. Women are more likely to experience gallstones than men, and women over the age of 40 (entering menopause) are more likely to experience them than their younger counterparts. 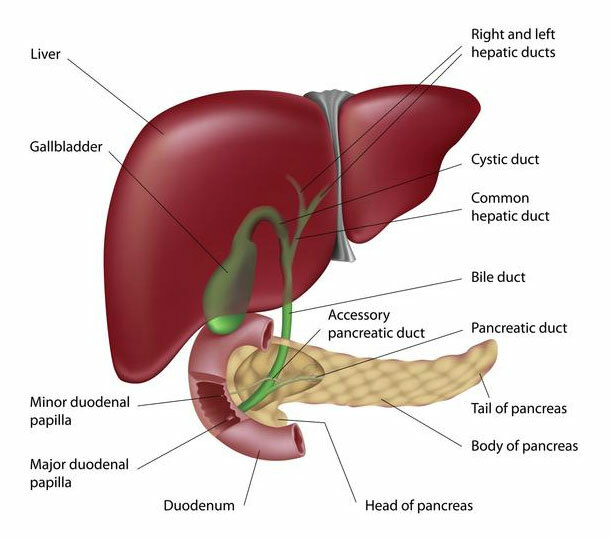 The gallbladder is an organ that stores bile, a fluid that is produced by the liver. Bile aids in the digestive process of lipids (fats and fat-soluble vitamins) in the small intestine. It is an important cog in the wheel to maintaining a healthy digestive system. Gallstones form within the gallbladder which is a part of the digestive system, though it is not integral to the digestive system functioning. Since the Gallbladder only stores the bile and distributes it into the small intestine, but does not actually make it, gallbladder removal surgery, known technically as a ‘cholecystectomy’ is a perfectly safe treatment for gallstones. Just removing the stones will not work as the gallbladder is diseased. There are two types of surgery for cholecystectomy. The first is called a ‘laparoscopic cholecystectomy’. Completed using keyhole surgery. The second is more invasive and is called an open cholecystectomy. Gallstones are caused by many factors, and whilst some of these are systemic of lifestyle choices, genetics can also play a part in whether an individual might develop gallstones later in life. Rapid weight loss, haematological (blood-related) disorders, obesity and age are all common factors that can contribute to the dysfunction of the gallbladder. This results in gallstones occurring and the need for treatment, often gallbladder removal surgery. Gallstones form when a super-concentration of bile within the gallbladder solidifies to form stones. The size of a gallstone may vary from that of a grain of sand to the size of a grape. These stones are often light yellow to dark green in colour and are oval-shaped. They typically have a dark central spot and are several centimetres in length. As these stones can be quite large, they can also be quite painful. To be classified as this type of stone, more than 80% of the stone must be cholesterol by weight. Known as “black pigment” stones, these are small, dark and typically are quite numerous. They contain around 20% cholesterol with their main constituent being calcium-based salts that are found in bile. Between 2% and 30% of a collection of gallstones within an individual are classified as Bilirubin. Mixed stones contain a mixture in various quantities of cholesterol stones and Bilirubin stones. They are often visibile through radiography due to their calcium content (this is also true for Bilirubin stones). Approximately 4-20% of a collection of gallstones within an individual will be mixed. Though gallstones can be asymptomatic for a significant amount of time, symptoms can manifest at any time. They often include pain in the right side under the right rib. The pain usually is sharp and lasts anywhere between half an hour to six hours. The pain is typically brought on by a fatty or a dairy rich meal. Gallstones can cause a series of complications such as acute cholecystitis, pancreatitis and cholangitis. Cholecystectomy is a safe procedure that requires a general anaesthetic and overnight stay. The main risks being leakage of bile and bleeding, which is, less than 1% incidence. Mr. Gounder has done close to 2000 of these operations, so you are ensured to have a safe operation with a quick recovery time.